A pillar of effective policing and community safety is strong prevention, education, and public engagement. 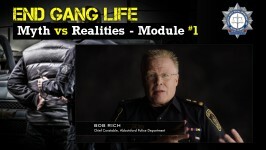 The CFSEU-BC continually seeks to foster and promote conversations about gangs. Whether it is through traditional media releases or by engaging people on Social Media, these conversations are critical to educating people about gangs and informing the public what the CFSEU-BC is doing in communities across British Columbia. The Combined Forces Special Enforcement Unit of British Columbia (CFSEU-BC) would like to introduce Sergeant Brenda Winpenny as the organization’s new Media Relations and Community Affairs Officer. Sgt. Winpenny has 17 years of service as an RCMP officer and brings a wealth of front line policing experience to her new role. Sgt. Winpenny has worked in a number of RCMP detachments in British Columbia as well as Federal investigative units, and has been a key team member in large scale drug and organized crime investigations. She has extensive experience addressing and implementing solutions to complex community issues as well as detachment spokesperson which will be beneficial in her new role at the CFSEU-BC. She will now transition into the role of CFSEU-BC Media Relations and Community Affairs Officer and her experience will enable her to have the tools necessary to be a resource to both media and the community. The CFSEU-BC’s Community & Public Affairs team uses traditional media, social media, and a variety of mediums to reach out to people in all corners of the community including teenagers, young adults, men, women, at-risk youth, parents, teachers, police, front line workers, and policy makers. From the End Gang Life initiative website, to Twitter and Facebook, engaging the public in conversation about gangs and gang violence is extremely important…no matter how it is done.